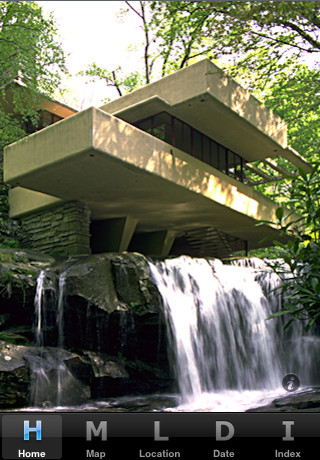 The application home page, shows Wright's 1935 masterpiece, Fallingwater. The tab bar at the bottom lets you quickly access the different ways of navigating through the application, by Map, Location, Date, or Index. 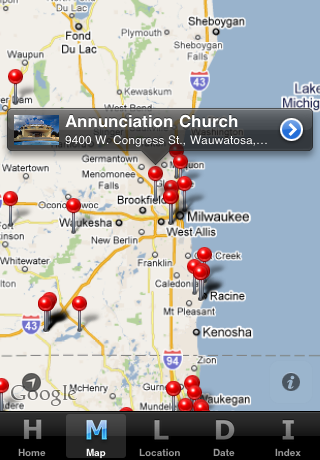 Directions to buildings can be obtained, and there is also some other navigation possible through the application. 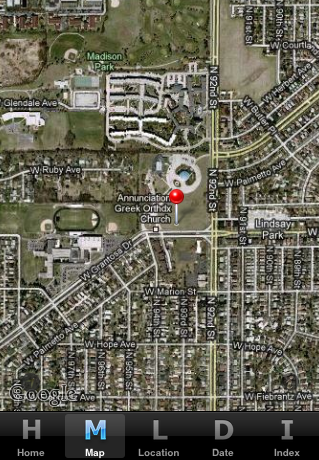 The application has a map showing all of the buildings that have known locations. (This requires access to the internet.) Each building has an associated red pin, and if you touch the pin then it pops up an information "bubble" which gives the name of the building. Touching the arrow button goes to the page for that specific building. On that page you can navigate back to the map by either touching the Map button at the top left on the navigation bar, or by touching the Map tab bar button at the bottom. 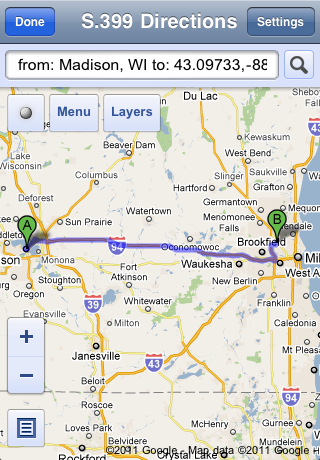 Touching the location button at the bottom left of the map will pan the map to your (approximate) location. 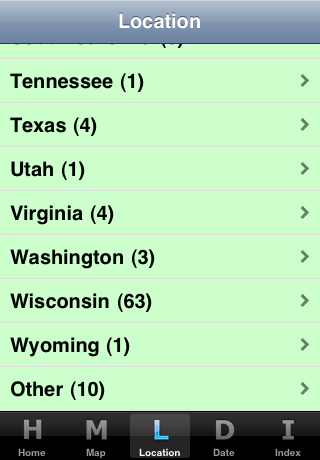 The application has a list of locations for the buildings by state (plus "Other"). Touching the state goes to a list of the buildings in that state by city. Touching a building in that second list goes to the page for that specific building. The application has a list of dates by decade for the buildings. Touching a decade goes to a list of the buildings in that decade by year. Touching a building in that second list goes to the page for that specific building. 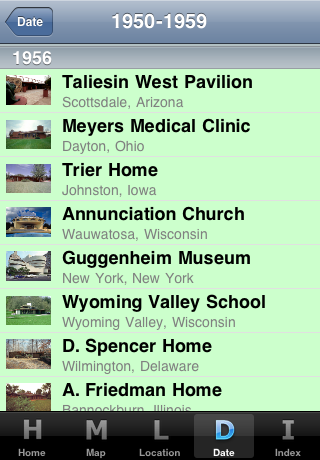 The application has a list of all the buildings. 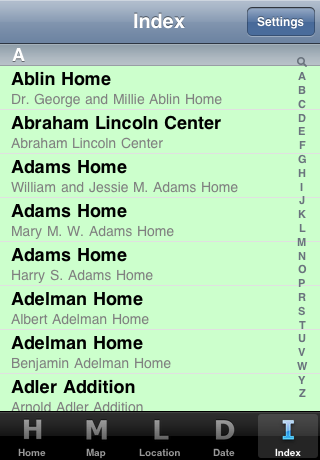 By default this is sorted by Storrer code but it can also be sorted by name. There is a shortcut at the right to quickly navigate to a specific range of buildings. This also has a "magnifying glass" at the top and touching that brings up a search box, which allows a filtering of the buildings based on the search term. 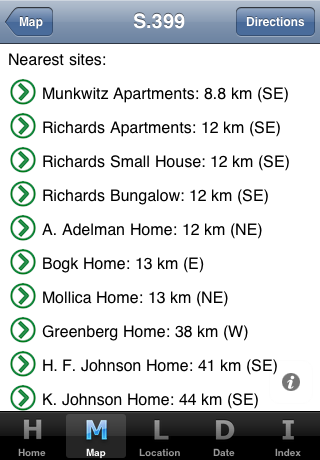 Touching a building in the list (filtered by a search term or not) goes to the page for that specific building. Directions can be obtained for each building which has a known location. (This requires access to the internet.) At the top right of the page for a building is a Directions button and touching that provides directions to the building. 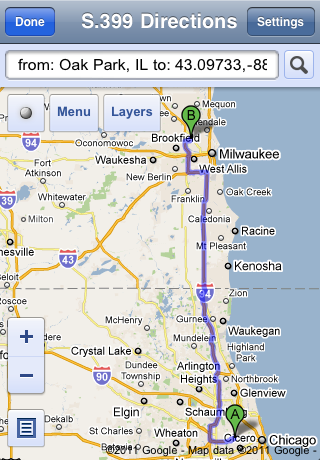 By default the start point for directions is Oak Park, IL. This can be changed by touching the Settings button in the Directions page. 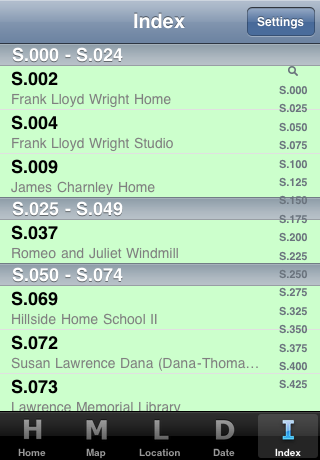 By default the start point is the selected row in this list, and the end point is the Wright building, but you can swap these two roles around by selecting "End" in the "Role of place". Selecting the "My Location" row means that you want your current location to be the start point. When you are done editing, touch the "Select" button (at the top right). You can then select the row of the location you want, and then touch Done to get back to the Directions page. There are a couple of other ways to navigate around the application starting from a building page. 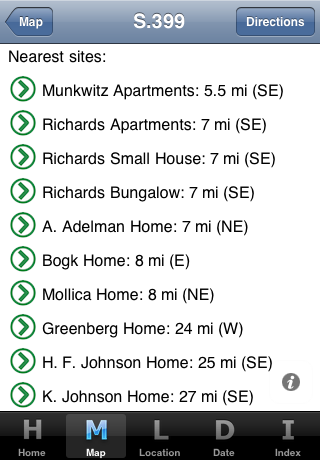 At the bottom of the page, after the description, is a list of up to 10 nearby buildings (if there are any within 100 miles). Touching any of the arrow buttons goes to that building. 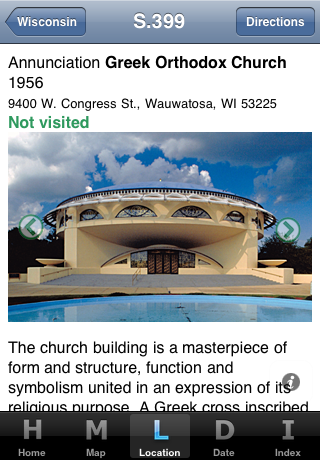 In addition, if the building page has been arrived at from all but the Map page, then the photo also has buttons at the left and right, which can be used to go to the "previous" and "next" buildings. With Location navigation, the "next" building is the next building in the same city, or the first building in the next city if there are no more buildings in the original city, or the first building in the first city in the next state, if there are no more buildings in the original state. And similarly for the "previous" building. With Date navigation, the "next" building is the next building by date, and similarly for the "previous" building. With Index navigation, the "next" building is the next building by Storrer code or by name, dependent on how the index is sorted, and similarly for the "previous" building. This respects any filtering by a search term, and so if there is only one building that matches the search term then the "previous" and "next" buttons are not there. 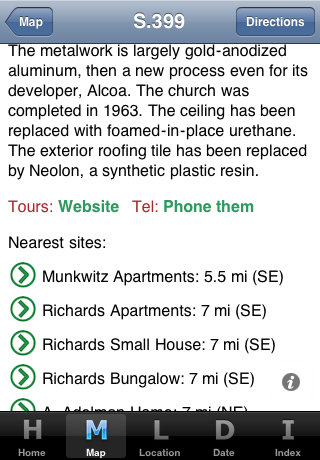 Touch the green "Not Visited" text (near the top of a building page) to bring up a new page where you can specify that you have visited a building and on which date. You can also type a (short) note. 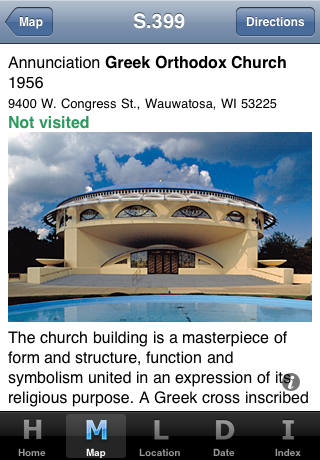 When you touch the Done button, the building page will show the information you have entered. If instead you touch the Cancel button then nothing will be changed. This feature is new in v1.1. Buildings that are open, have tours, etc. Many of the buildings are open to the public, or have tours, or can be stayed at as a Bed and Breakfast or can be rented. When this is the case, it is indicated at the bottom of the text. 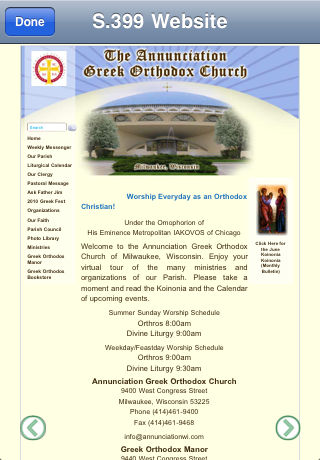 The corresponding website can be visited by touching the green "Website" text. This is embedded in a browser in the app itself, so you do not have to leave the app to view the information. The browser window can be pinched to expand (or contract) the view. You can navigate in the browser as normal, and the green arrows at the bottom let you go back and forward between browser pages as desired (when there is a page to go back or forward to). When you are finished with the website, you hit the Done button to get back to the building page. Where applicable, you can also telephone the site by touching the green "Phone them" text. These features are new in v1.1. Touching the "Settings" button on the index page opens up a dialog which lets the index sort order be specified. By default it is sorted by Storrer code but alternatively it an be sorted by name, by touching the "Sort by Name" row to give it a check. 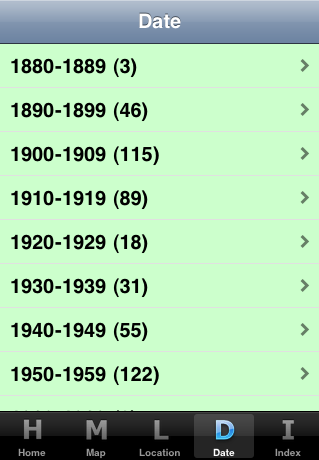 Hit the Done button to get back to the Index page. This feature is new in v1.1. 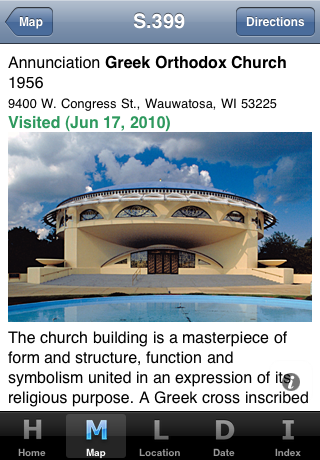 Touching the "Settings" button on the index page opens up a dialog which lets the index page be filtered so that it only shows buildings which are open to the public, or have tours, or are available as a Bed and Breakfast or for rental, or none of these, and separately it can also be filtered by whether or not you have visited the building. 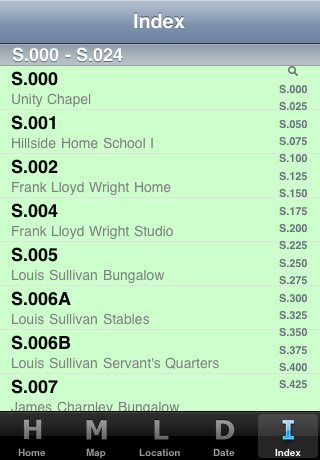 Check the rows that indicate what is to be included (by default they are all checked). This feature is new in v1.1. Touch the "information" button (at the bottom right) of the Map page to bring up the Map Settings page, where you can select to show the map in aerial view. By default the pins indicating the buildings on the map are red. You can highlight, in purple, buildings that are open to the public, have tours, or are available as a Bed and Breakfast or for rental, or also those you have visited. Touch the "information" button (at the bottom right) of the Map page to bring up the Map Settings page, where you can select which types of buildings to highlight. This feature is new in v1.1. Touch the "information" button (at the bottom right) of a building page to bring up the Site Settings page, where you can choose the distance unit (used when indicating the distance to nearby buildings) in km instead of miles. For questions and comments please send an email to info [at] cambridge2000 [dot] com, where [at] is replaced by the "@" symbol and [dot] is replaced by ".". Application photos and text © 2010 William Allin Storrer. 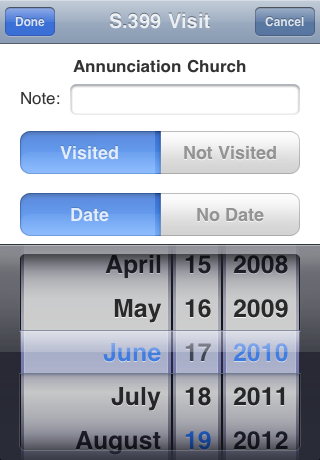 Application software © 2010-2011 Azara Apps.